I was thinking about writing on this topic during the holiday season but I was too filled with the Christmas spirit. Year after year, children and adults alike are baffled by the mystery of how Santa really knows who’s been naughty or nice. After much urging by the elves and Mrs. Claus, Santa has allowed his biggest secret to be revealed in The Elf on the Shelf: A Christmas Tradition. Touted as “The best thing since The Night Before Christmas” this gift set includes a light skin, blue eyed North Pole pixie-elf, hardbound children’s book and keepsake box. Children can register their elf online and receive a special response from Santa. That's the manufacturer's statement which can be found at Amazon.com . This book-doll combo is fiendishly clever. The book explains that Santa employs his own Stasi sprites to keep an eye on children all over the world. The doll is one of these watchers. At night the elf comes to life and flies to the North Pole to dish the latest dirt to Santa. According to a local newspaper article, the manipulative parents move the elf doll to various locations around the house when the kids are asleep, thus giving the impression that the elf came alive and made his report. I can imagine what the stuffed snitch is reporting back to Satan -- I mean Santa. Probably ratting out Little Johnny who has been peeing with the seat down or turning in Little Jane who has been sneaking into her parent's bedroom and sticking pins in those funny wrapped balloons she found in the nightstand shelf. A family with three children was profiled in the article. The Big Brother elf worked so well that one kid was eating new foods he wouldn't touch before. Hey, kid, do you really like those Brussels sprouts? Wait until you're older and just the smell of them makes you puke because you forced yourself to eat them to score more Xmas loot. A friend of the family also bought the book-doll combo and "found it to be an effective behavioral tool." Behaviorism, anyone? The shelf elf also teaches young ones to rat out someone to the authorities, a brother telling on his sister to mom and dad. Let's stoke that sibling rivalry up a full notch. Let's also mold those impressionable minds to never question authority, to always do what is right, that is, "right" as defined by authority. The doll also reinforces magical thinking: kids are told to talk to the elf to send along messages to Santa. Wait until those kids grow up and find out that Santa -- and even God -- was all a big lie to keep them under control. Back in the old days kids used to flock to the local cinema for the matinee serials featuring their favorite heroes. Each segment would end with a cliffhanger, for example, the hero is trapped inside a car that suddenly explodes. Is our hero dead? Nope. When the fan returned to the theatre the following week, he would see the exploding car but this time an extra preceding scene would be included showing the hero leaping to safety before the car burst into flames and flew over a cliff. An example of this hokum is the serial, Blackhawk: Fearless Champion of Justice, from 1952. Blackhawk was a popular character featured in Quality Comics during World War II who led his international team of brave aviators in strikes against the Nazis. After World War II Blackhawk relocated his base of operations from Europe to the USA where he continued to battle enemies of justice and freedom. In this serial he's fighting a spy ring trying to get its hands on futuristic inventions created by American scientists. At one point the bad guys finally come up with a sci fi weapon of their own, a remote-controlled flying disc targeted at Blackhawk and his plane. 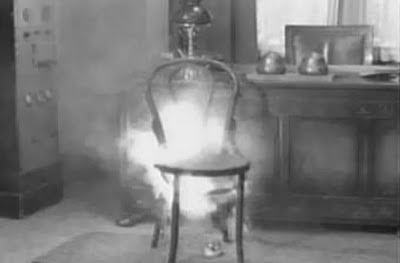 As you can see from the above image, special effects were on the crude side for this serial. 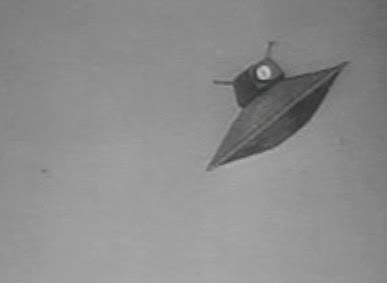 Instead of a frightening device, the viewer is treated to a cute cartoon flying saucer. Wheee! And how does Blackhawk manage to stop the deadly disc? Simple. He pulls out his handgun and shoots it down in mid-air. 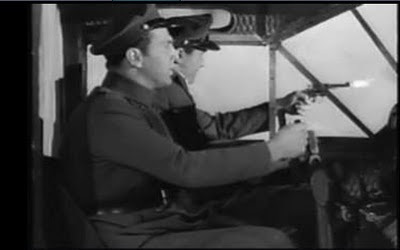 Note in the above still capture that Blackhawk is aiming his gun out the window of the cockpit door but it appears the gun is still firing through the windshield. There must be a windshield because no air is blasting through, messing up Blackhawk's hair or blowing off his cap. So how can he fire through a window without shattering it? Bad low-budget production values? Naw. You see Blackhawk's special plane must have one-way superscience glass that keeps out the elements but allows bullets to pass harmless through in the opposite direction. One device the spy gang is trying to steal is the electronic combustion ray. 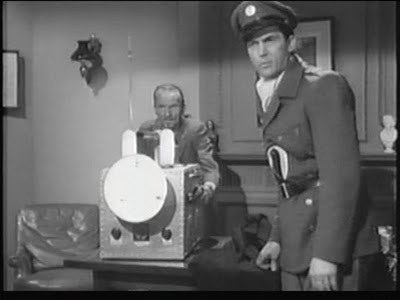 When Blackhawk meets the inventor, he looks at the ECR and says: "So this is the secret device that you have been secretly perfecting for the government." "Evidently you have created something worth stealing." Whose speed was much faster than light. So this weapon should destroy its target before the button is pressed. But we don't see that in this Blackhawk movie. If there's anything I hate, it's bad superscience. Jim Moseley has been around since the early days when UFOs were usually called "flying saucers." Besides being the author (with Karl Pflock) of the book, Shockingly Close to the Truth! Confessions of a Grave-Robbing Ufologist, he is also the slightly opinionated writer-editor of the world's longest-running UFO newsletter, Saucer Smear. (Longest running in the sense his newsletter has existed under various names such as Saucer News.) Jim can be reached via snail mail at PO Box 1709, Key West, FL 33041. A donation of two dollars (cash) will get you a copy of his gritty zine. You can (indirectly) contact him via email: saucer_smear@yahoo.com [link]. Please mention Ray X sent you. He enjoys name-droppers. My friend "Ray X" has asked me to write a brief article about my personal experiences with these famous mystery lines on the coastal desert of Peru. These incredibly straight lines, sometimes over a mile long, cover an area of a couple of hundred square miles. There are at least two man-made mounds where several lines converge, giving the impression that treasure might be buried there. There are also large animal figures laid out on the desert, among the lines. The Nazca civilization, running from about 100 B.C. to 800 A.D., preceded the Inca empire. As a shameless treasure hunter, I have dug up many Nazca tombs containing beautiful pottery, wooden figures, and sometimes gold. It is known that the lines were made by this same ancient tribe. 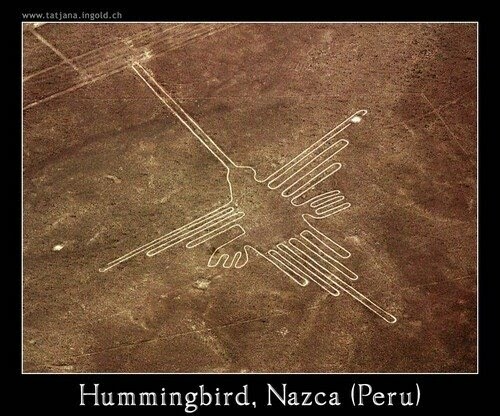 The myth is that the Nazca lines were some sort of landing field for spaceships from other planets. Superficially they look a bit like a modern airport. The pattern can only be seen from the air, but after all these many years the lines are so faint that all the aerial photos I have seen are enhanced artificially to make the lines more visible. There is no mystery whatever as to how the lines were made. The Nazca desert consists of a very shallow layer of small reddish rocks containing iron ore, and other similar rocks not much bigger than gravel. By going down less than half an inch you come upon pure white sand. You can take a wide broom and easily make a line for yourself, as incredible as this must sound. Your line, like the others, can last almost forever, because there is almost no wind or rain whatever in this area. In the 1950s I spent a lot of time treasure hunting in Peru, and was quite successful. At that time there was a German archaeologist named Maria Reiche who studied the lines in infinite detail for many years. She wrote an uncopyrighted pamphlet available in English that was on sale in Peru. I edited it to suit myself, and published it under my name in America's FATE Magazine in 1955. Much later, along came Erich von Daniken and many other sensationalists who jazzed up the story for fun and profit, according to their own fantasies. In 1956 or 1957 I, amazingly, obtained written permission from the local museum to dig for two weeks in the Nazca valley, including the nearby lines. I went with a small group of diggers to one of the above-mentioned mounds at the Intersections. I know of no one else who has ever done this. Unfortunately, we found absolutely nothing. The Nazca tombs are available elsewhere, as we knew. It is clear that there is no mystery at all as to who made the lines, how they did it, and when they did it. The only question is in regards to why. Attempts to correlate the lines with bright stars and planets have proven unsuccessful for several reasons. The interplanetary theory is out. Recent archaeologists relate the lines to the eternal search for water on the desert, but this theory seems complicated and incomplete, from what I have read. Maria Reiche, for all her years of tirelessly mapping the lines, never found out why they were made. She died quite recently. Now I'll tell you something of archaeological importance that I have never written about till now for various reasons. Before I had ever actually seen the lines myself, I was driving one day near Lima with two friends, on a dirt road across a desert very similar to the desert a couple of hundred miles away at Nazca. There, running for perhaps a hundred yards through a tiny valley next to the road, was a line identical in appearance to the ones at Nazca. There may well have been others nearby that we didn't see. No Nazca pottery, etc., has ever been discovered near Lima, so the conclusion seems to be that other ancient tribes made lines like this for the same reason that the Nazca people did - whatever that reason may be. You may wonder why I didn't publicize this discovery. Unfortunately, the line was in a little valley almost exactly like hundreds of others, and would be very hard to find again. By now, it is probably under a condo, as the city of Lima has grown tremendously in recent years. 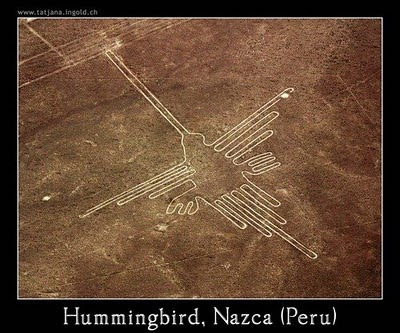 My opinion is that there are plenty of genuine mysteries on this planet without the necessity of distorting a minor mystery like the Nazca lines. Immediately comes to mind a huge pre-Inca fortress near Cusco, the old Inca capital in the heart of the Peruvian Andes. It is called Sacsayhuaman, and is right next to the main road leading to Cusco. I have had my picture taken there, as have thousands of other tourists over the years. The problem here is that Sacsayhuaman consists of huge boulders as heavy as one hundred tons each, piled on top of each other to make walls. Stone can't be carbon-dated, as far as I know; so no one is able to tell us who built this fortress, when, and how. Even the most modern machinery could not move stones as large as this!